This product is intended for 4th & 5th grade root word practice. It is an interactive way to learn, study, determine the meaning of root words. 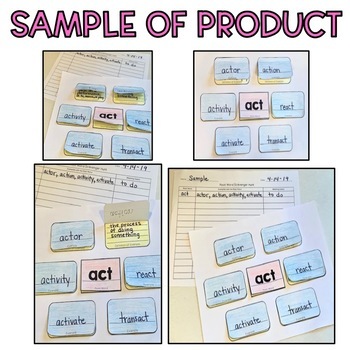 It is perfect for word study lessons and for review! 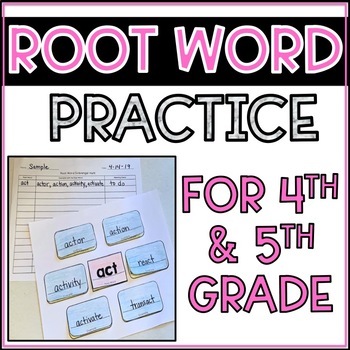 There are 27 root words included in this resource, two blank templates (for 4 and 6 examples), blank root word cards, blank example cards, and an answer key for the provided root words. 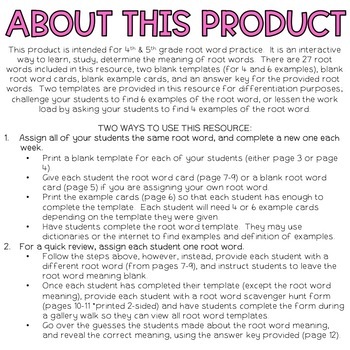 Two templates are provided in this resource for differentiation purposes; challenge your students to find 6 examples of the root word, or lessen the work load by asking your students to find 4 examples of the root word. View the preview for a closer look! Feedback is appreciated! Don't forget that you earn credits for leaving feedback on paid resources. Follow me on social media to stay updated on new resources and classroom happenings!